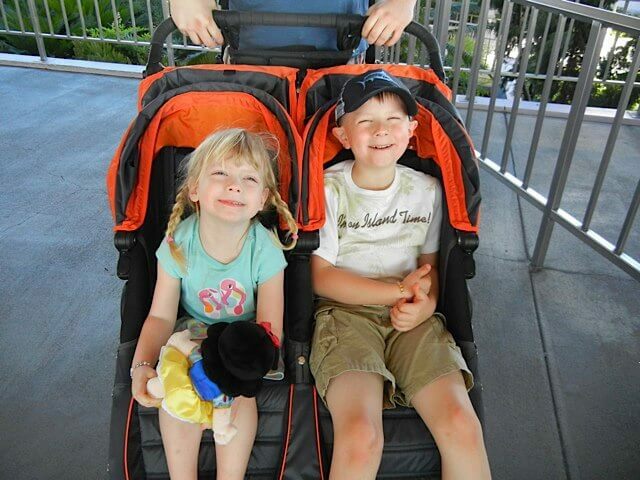 Home → Disney World → Do We Need a Stroller in Disney World? Wondering if you need a stroller in Disney World is a common question, especially if your children are not babies anymore. Most people assume they need a stroller for children 2 and under. But what about preschoolers? Are my kids too big for a stroller? Even though your kids may not use a stroller anymore for your everyday activities at home, you may find Disney World is a whole lot more manageable for them with a stroller to cruise in. Most guests end up walking well over 10,000 steps per day, and as you can imagine, that’s a lot for tiny legs to handle. Having a stroller for kids up to age 6 can help reduce over-tiredness, tantrums and melt downs and allow everyone to have more fun. Plus, when crowds get a bit tight, it can be a lot less stressful to have your kids contained in one spot as you navigate through. And, while I often recommend a mid-day break at the resort to my clients, for a variety of reasons, for those families who won’t take a break, a stroller makes a convenient place for an afternoon nap. Should I bring a stroller or rent a stroller? Ok, so let’s say you’ve decided a stroller is the way to go. Should you bring one or rent one? Certainly, if you have a stroller at home that suits your park needs, you can bring it along. It’s free to gate check at the airport, so if you don’t mind hauling it with you, it’s free to do. However, many of my clients have two kids who could benefit from a stroller, and yet they don’t own a double stroller. Or perhaps they have just one child that they want a stroller for, but they already sold or gave away their stroller since it wasn’t getting used at home. In this case a stroller rental is the way to go. But Disney’s strollers aren’t usually the best option. Why? Well, if you rent Disney’s strollers, you are limited to using them inside the park. If your child falls asleep, and you need to leave the park, you have to wake them up as you return the stroller. Plus, each day you’ll have to get in line to rent the stroller again. An easier option is a third party stroller rental. Disney has a selection of preferred stroller rental companies, and the one I use most often for my clients is Orlando Stroller Rental. We can choose from a variety of sizes to make sure you have the right stroller for your needs, and then it gets delivered right to your resort. You return it at the resort as well. Super easy! And you can take it in and out of the parks and around the resorts as much as you’d like. Generally speaking, when you can keep your little ones less tired, you’ll all have more fun! So when in doubt over whether you need a stroller in Disney World, I’d always err on the side of YES.